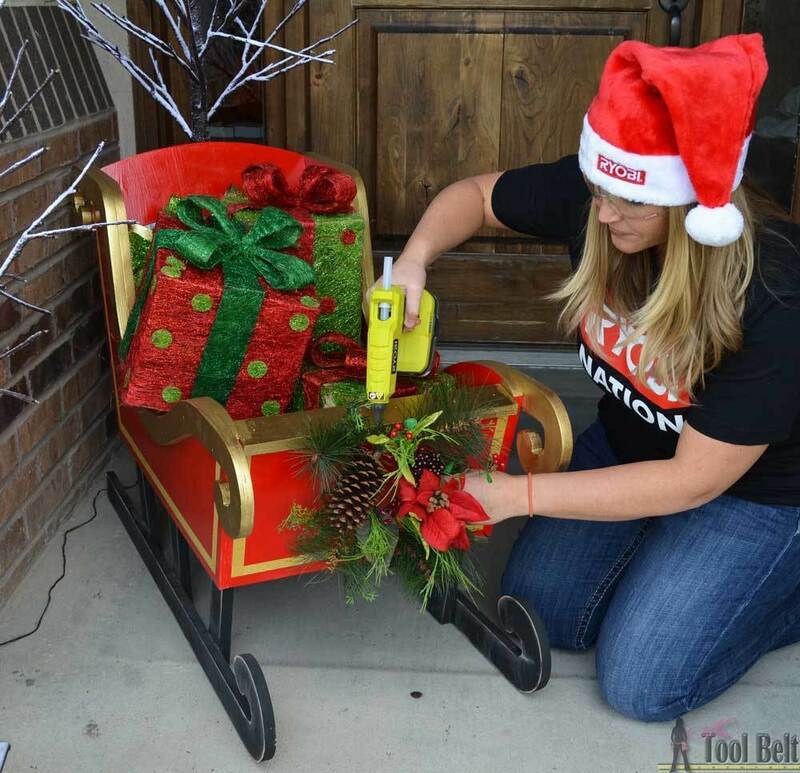 Stack up the presents this Holiday season in Santa’s DIY wood sleigh. 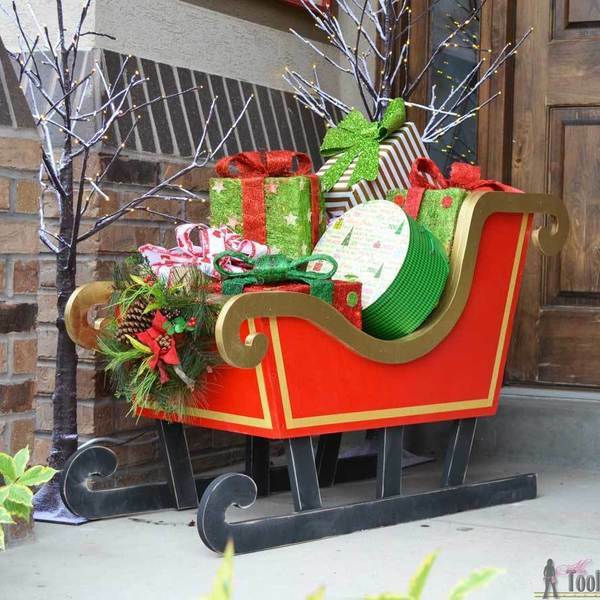 This sleigh is great for holiday decor or for a photo prop for the kiddies! 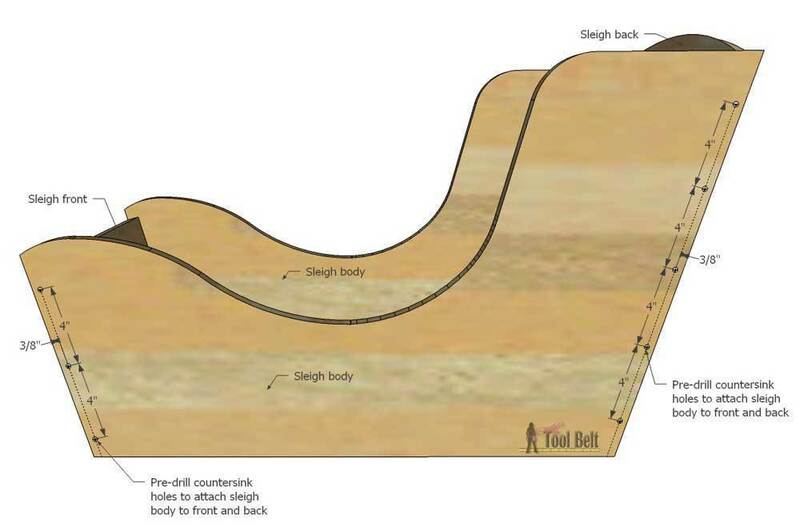 Print sleigh pattern (10 papers). 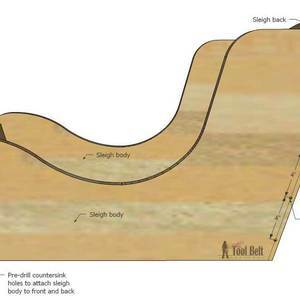 Use guide marks to line up and tape together sleigh pattern. 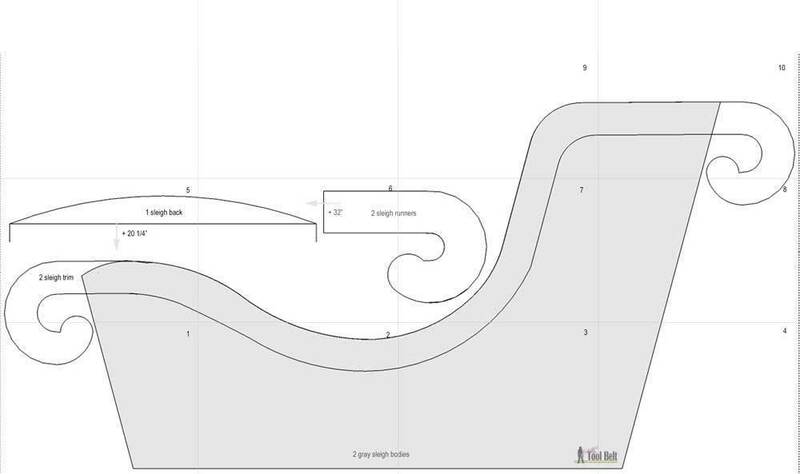 Cut out the sleigh pattern. Cut Diagram Note: if you need to have your plywood sheet cut for transportation, cut it at 20” x 48”, 6 ¼” x 48”, and 16 ½” x 48”. 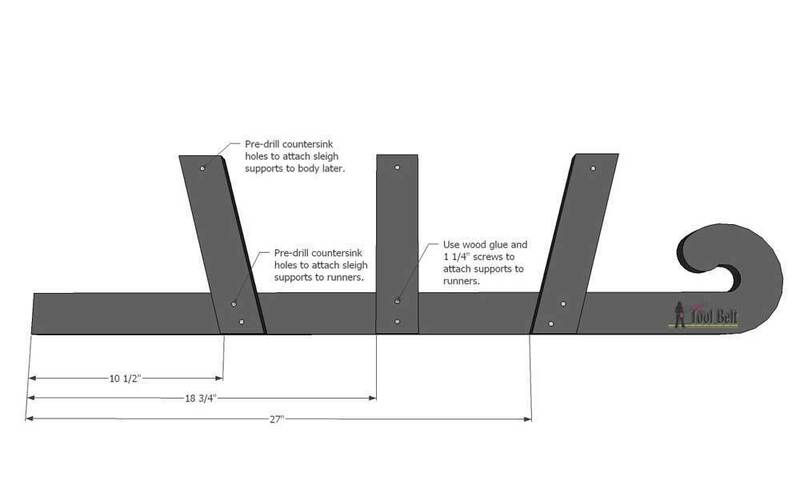 Cut the 1x3: 1 – 16 ½”, 2 – 9 ¾”, and 4 – 10 1/8” with 15 deg miter cut on each end. Trace the patterns onto the sheet of plywood. 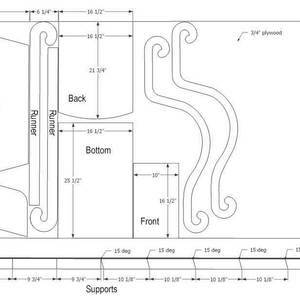 Trace 2 sleigh bodies (gray portion of pattern), 2 sleigh runners, 2 sleigh trim, 1 sleigh back. 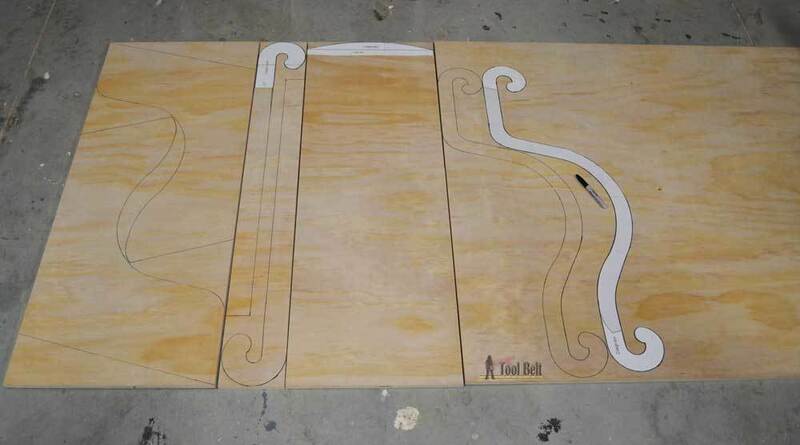 Also cut 1 front 16 ½” x 10” and 1 bottom 16 ½” x 25 ½”. 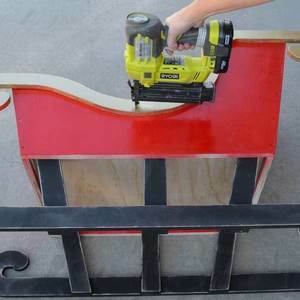 Cut out the plywood sleigh pieces with a jig saw. 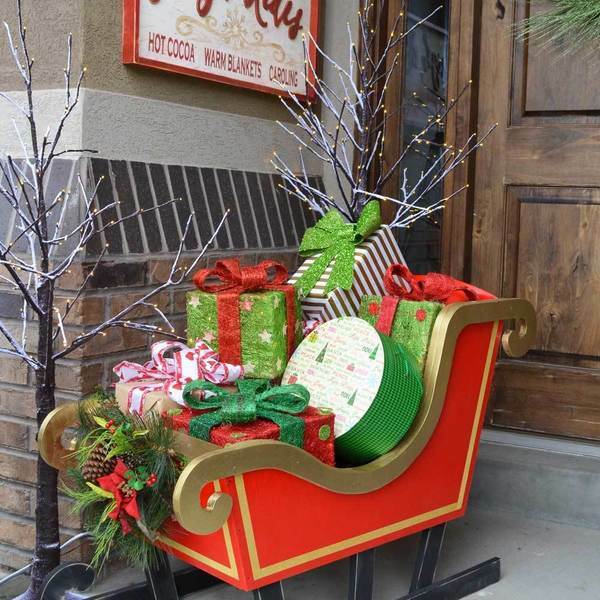 Sand the sleigh pieces as necessary. 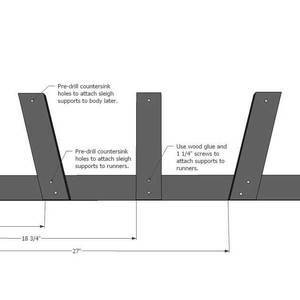 Countersink holes – Mark approximately 3/8” from the front and back sides of the sleigh bodies. Pre-drill countersink holes approximately every 4” to attach the front and back pieces. Repeat for both bodies, remember they mirror each other. Assemble body – Use wood glue and 1 ¼” screws to attach the sleigh bodies to the front and back pieces. 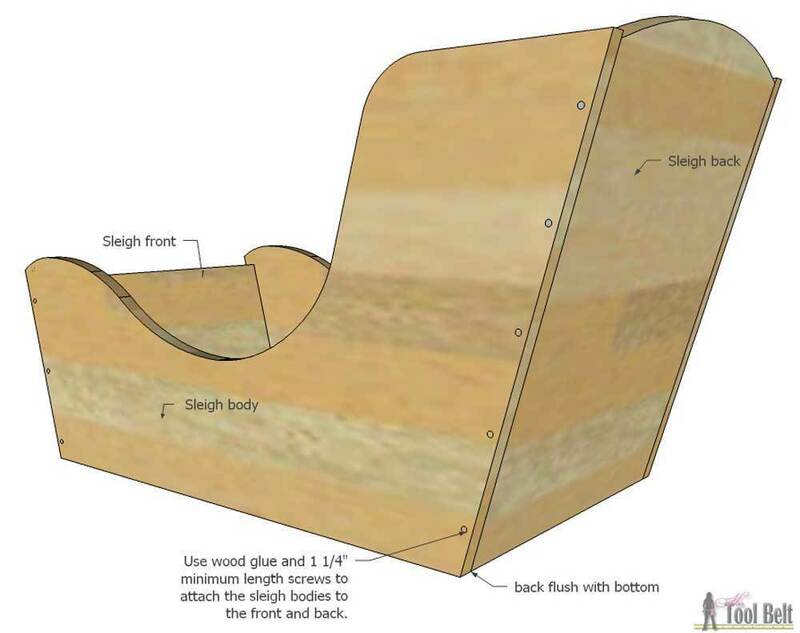 The front and back pieces should be flush with the bottom of the sleigh bodies. 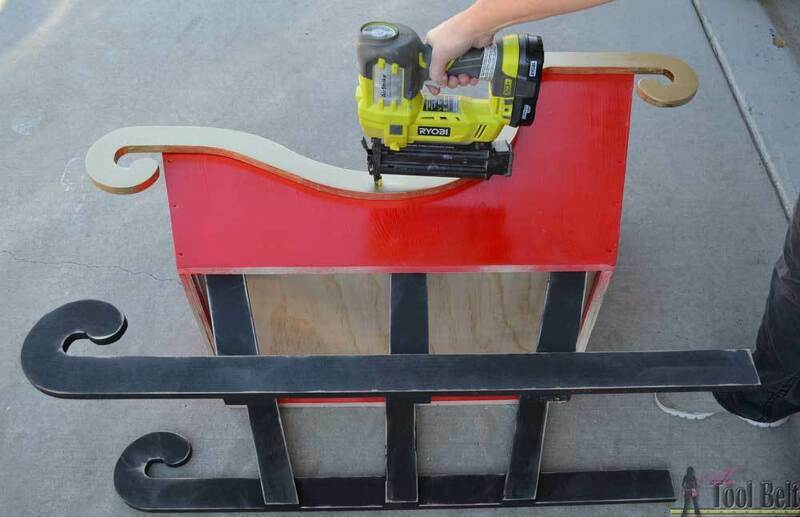 If you want to disassemble the sleigh to store, skip the wood glue and only use screws. Note: I painted the sleigh body and various pieces at this point. 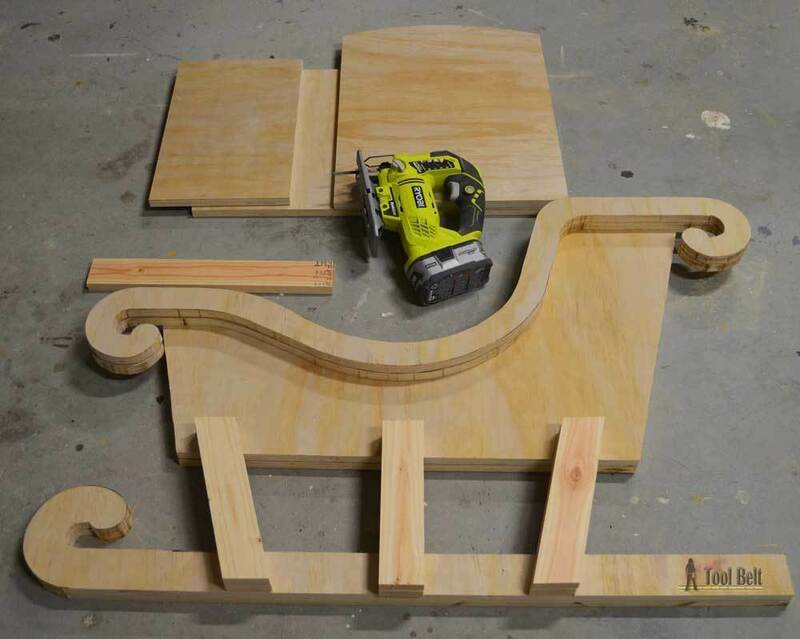 Assemble runners – Mark over about 10 ½”, 18 ¾”, and 27” from the end of the sleigh runner to attach the supports. Pre-drill countersink holes to attach sleigh supports to runners, and to attach supports to sleigh bodies later. 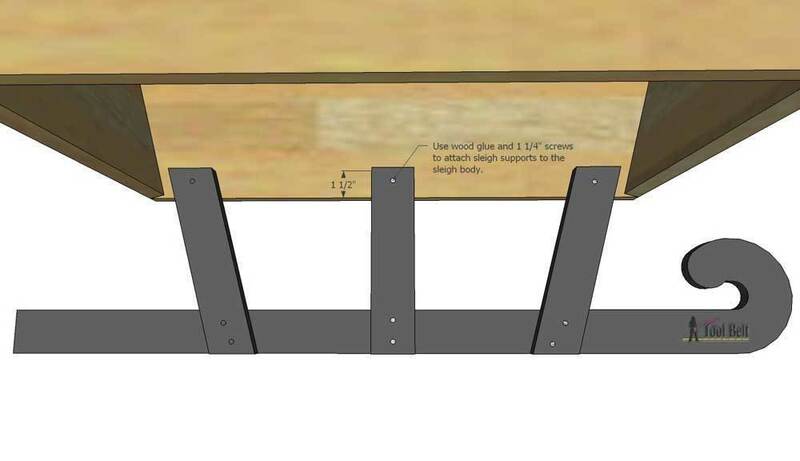 Use wood glue and 1 ¼” screws to attach supports to runners. Repeat for both runners, remember they mirror each other. 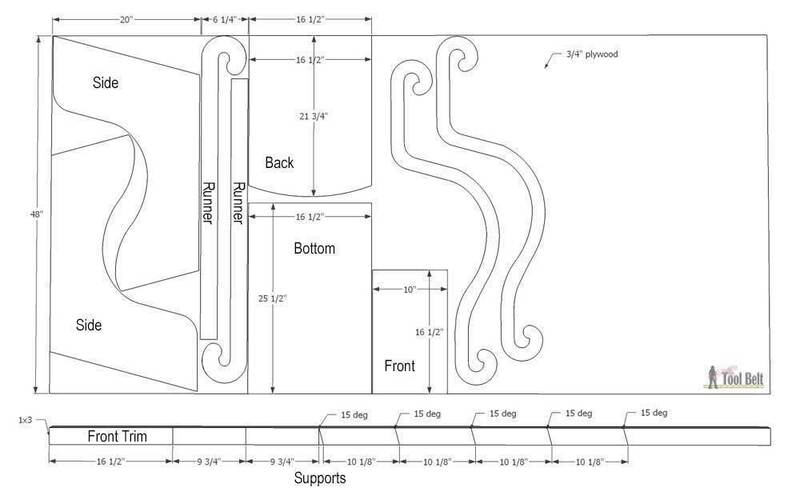 Attach runners to body – Mark about 1 ½” from the bottom of the sleigh body to attach runner supports. 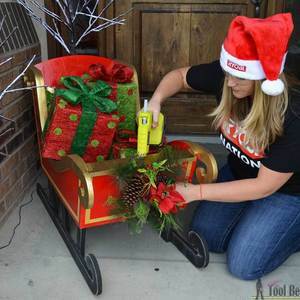 Use wood glue and 1 ¼” screws to attach sleigh supports to the sleigh body. Repeat for other sleigh runner. 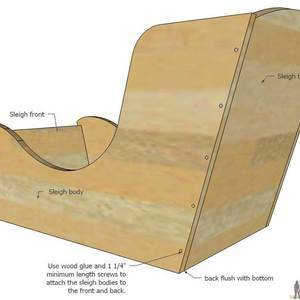 Attach bottom and trim– Place sleigh bottom onto the supports, trim the bottom piece to fit as needed. 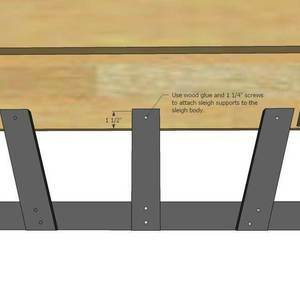 Use screws or brad nails to secure bottom into place. Center front trim piece on sleigh front piece and secure with brad nails or screws. 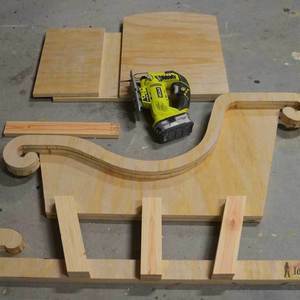 Attach the remaining sleigh trim pieces to the sleigh body with wood glue and brad nails. Add accessories and décor to your sleigh. 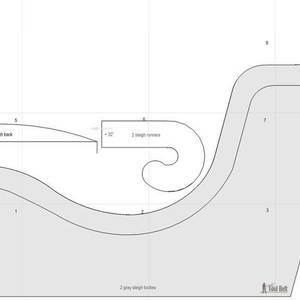 I printed the sleigh pattern but there is no printable pattern for the Cut Diagram for the bottom of the sleigh? 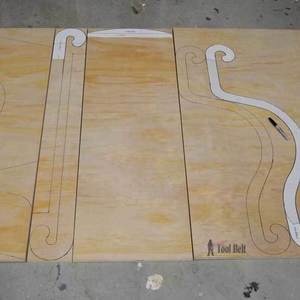 Sorry the bottom and front are in step 3 "Also cut 1 front 16 ½” x 10” and 1 bottom 16 ½” x 25 ½”." Check out the link above where it says "View project PDF." Enjoy! 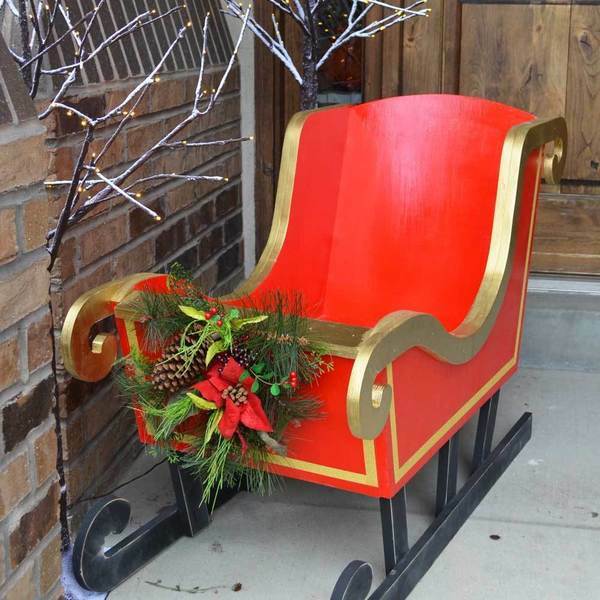 Me and my dad made this Sleigh for my mom for Christmas 2017. She loved it.........I took old chair springs to make bells for the decor for the front of Sleigh. 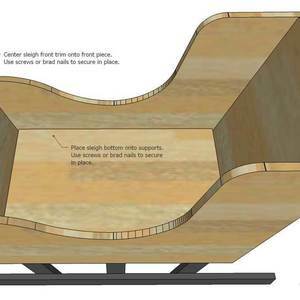 Was 1/2 inch or 3/4 plywood used?